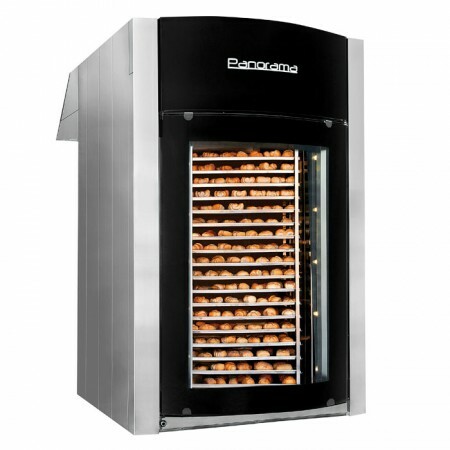 For over 50 years Real Forni has been designing and manufacturing bread and pastry ovens with the aim to satisfy the professionals of this important food sector. Their satisfaction is our goal and the best way to promote ourselves. The new rotary oven Boss combines innovation and technology with the yearly experience and tradition of the company thus becoming the reference model of its category. Maximum efficiency, reduced overall dimensions and low consumption are the key features that allow the user to save energy and space, reduce the cost of maintenance and improve the result on the baked product. For laboratories or shopping malls, the version PANORAMA allows customers to have a direct view on the products and at the same time to keep the laboratory safe from prying eyes. The version is available also with LCD screen on the back of the oven to check the product and the baking process. A perfect baking in rotary ovens is the result of a correct distribution of the heat and of the ability to bake the product with a gentle and abundant flow of air: this is the only way to equal the baking of a static oven. A steamer has to produce a big quantity of steam in a short time and generate it for the following baking process. Thanks to its rapid and powerful steamer situated in the middle of the air flow, it is possible to get crisp crust and friable products. Only 50.000 kcal/h to reach the desired temperature! 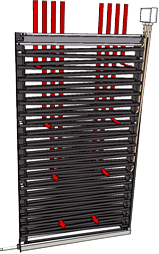 This is possible when the baking system is composed by two powerful fans and by one heat exchanger with three smokes turn. Then three rock wool layers permit its perfect insulation. Thanks to its reduced overall dimensions, Boss takes up small space and leaves more for your future ideas. All components requiring maintenance are situated in the front side of the oven and are easily reachable. In this way you can place ovens side by side with back side against the wall thus avoiding waste of space. Each product Real Forni is designed to be a component of a winning team, and therefore compatible with the rest of the range in ergonomics, size and design. This feature creates a harmony within the laboratory and this is a prerogative of quality environments.